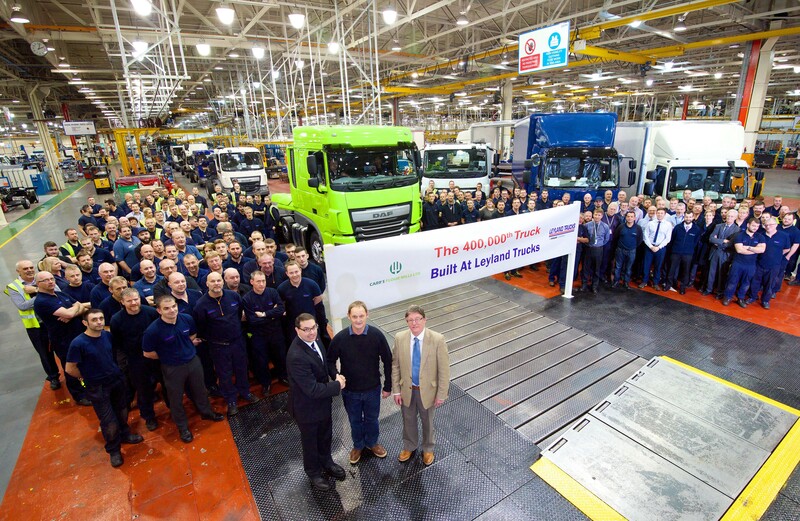 Leyland Trucks celebrates production of 400000th truck - DAF Trucks N.V.
Leyland Trucks in the United Kingdom has produced its 400,000th commercial vehicle, since the opening of the current assembly facility in 1980. The milestone vehicle, a DAF XF 460 FTP tractor unit, was handed over to customer Carr’s Flour of Silloth in Cumbria, located in the North-West of the country. Carr’s Flour is a renowned supplier of wheat sourced on national and international markets and delivered to a wide variety of customers from home and independent bakers to major food retailers. The company operates state-of-the-art milling installations, which process some 300,000 tons of wheat per year. For regional and national distribution Carr’s Flour relies on a fleet of 30 trucks, mainly DAF CF and XF models. The facility of Leyland Trucks was commissioned in 1980 and is one of Britain’s leading manufacturing sites. It is the center of production of the popular DAF LF distribution truck and also manufactures right-hand-drive DAF CF and XF models for the UK home market and for export markets around the globe.